The Tangerine Microtan 65 was first sold in 1979. Unlike other systems available at the time, it was designed with expandability in mind. 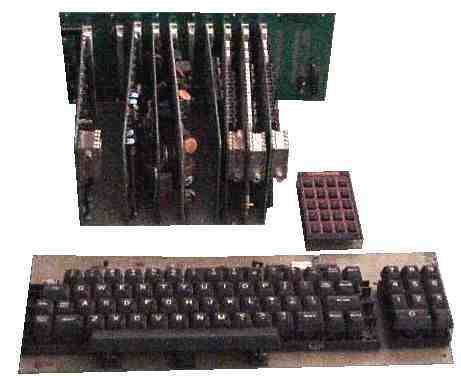 Based on the 6502 processor, the basic system could be expanded from 1k RAM, 1k ROM and 32x16 text only display to a full blown system with 48k RAM, banked EPROM, tape and disk interface, hi-resolution graphics, 6 channel sound, and more! Here, you can find out about the Microtan's history and development, read magazine articles and documentation and even use a Microtan 65 with a full featured emulator. I'd like to hear from anyone who's owned a Microtan - if that's you, please send me an e-mail or fill out the form below. 8th March 2004 - Updated emulator to include 3 Hi-Res graphics cards and improved screen update. 17th May 2000 - Added Microtan World Issue 6, ETI's 64k DRAM project and Tansoft Gazette. 16th May 2000 - Added Microtan World Issue 5. 15th May 2000 - Converted documentation into Adobe Acrobat 3.0 format. Added the Space Invasion and Life Gun articles from Computing Today magazine. 13th May 2000 - Added Microtan World Issue 4. 8th May 2000 - Site started! Loads Still to do. The Computer Museum needs some text, and the Microtan documentation is empty apart from issues 1&3 of Microtan World magazine.